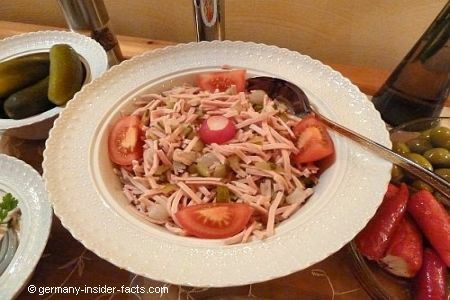 German Wurstsalat (sausage salad) is one of the most traditional German food recipes. Guess what? As so often, there are quite a few variations to this specialty. Most recipes come from the south of Germany and the bordering countries. There is an Alsatian, a Swiss, a Bavarian and a Swabian version. Lyoner is the most common sausage used for Wurstsalad, but you can also make it with Fleischwurst or Bierwurst. A good quality of the sausage is essential, of course. 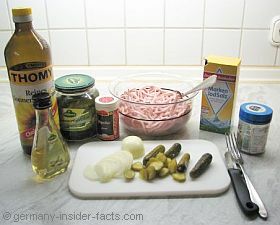 Prepare this delicious Wurstsalad the day before, it will taste even better because the onions are milder then. Swabian Wurstsalat is made with two different sausages, Fleischwurst and air-dried Blutwurst (black pudding). The Bavarian version is made with Regensburger sausage instead of Lyoner or Fleischwurst. Add 7 sliced radishes and a few cherry tomatoes cut in quarters. Add 5 tablespoons broth and 1 tablespoon mustard to the vinaigrette. 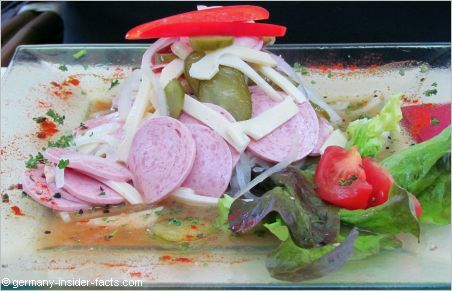 For Swiss and Alsatian (or Strassburger) Wurstsalat add 150g sliced Emmentaler cheese. Now imagine sitting in a beergarden enjoying your Wurstsalat. That's the real Germany! 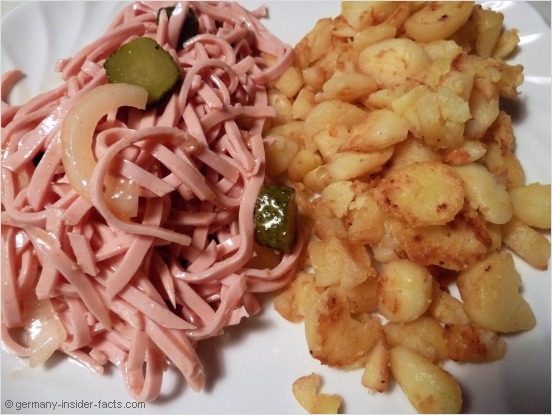 Fleischsalat is also made with Lyoner or Fleischwurst, plus mayonnaise. 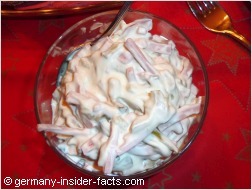 You will never find a Wurstsalat made with mayonnaise! Still hungry? Here are more traditional German food recipes for you.